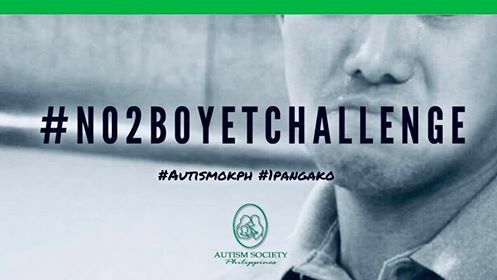 Why Filipinos should say "No" to the "Boyet Challenge"
The Autism Society Philippines condemned the latest social media experiment called "The Boyet Challenge" (where participants mimic the title character from the soap opera "My Special Tatay") as thinly-veiled instruments of ridicule of those who live with autism and intellectual disabilities, just as the Philippines began to the commemorate the National Autism Consciousness Week on the third week of January. In January 2019, the ASP called out YouTube influencer Benedict Cua on Twitter for posting a "72-hour Boyet Challenge" video. The ASP appreciates how Mr. Cua apologized in writing and via video; and has since taken down the original post. I like Ken Chan and his portrayal. Why are you against "My Special Tatay"? We condemn the "Boyet Challenge" social media trend involving the imitation of a popular fictional character named Boyet, because it uses traits of persons with disabilities for the purpose of comedic entertainment and social media notoriety. Sadly, this includes Mr. Chan (who joined and supported the Angels Walk for Autism years ago) who often slips into his Boyet character outside the context of his soap opera. "My Special Tatay" is an undeniably popular show with a wide audience base. When the show launched in August 2018, Ken Chan articulated his aspiration to be a "voice of people with autism". This made us hopeful that his portrayal of a man on the spectrum will inspire compassion and respect for persons with autism and intellectual disabilities as human beings, who do not deserve being spoofed in the name of comedic amusement. We would like to share a list of honest and nuanced portrayals of characters with autism and/or intellectual disability worth emulating: Alden Richards in Eat Bulaga's Lenten Special "Kapatid" (2017), John Lloyd Cruz in "The Trial" (2014), Gerald Anderson in "Budoy" (2012), Terence Baylon in "Ipagpatawad Mo" (1991), among others. We are keen on watching how Arjo Atayde's character with autism in "The General's Daughter" (2019) will be developed. The Autism Society Philippines serves in an advisory capacity on film and television projects that will further the understanding of autism through media. We especially commend actor Gerald Anderson for starting a foundation which trains dogs to serve in rescue missions and to act as service dogs to children with autism -- after his show ended and without the intention to promote his television project. He also partnered with Kiehl's Philippines to raise funds that will provide free therapy for children with autism from indigent families. Ginagawa po ang challenge para magpatawa. Bakit po naging nakakatawa ang mga taong may kapansanan na nahihirapan magsalita o parang musmos magisip? Hindi po makatao na gamitin ang hirap nila na pampatawa! Hindi po makatao na gawing katatawanan ang kanilang kaibahan! Para po sa mga milyong-milyong pamilyang Pilipino na may minamahal na may kapansanan, hindi po ito nagbibigay ng "good vibes". Here's an effect which can be measured by empirical data. With the popularity of the Boyet Challenge and its variations like the "Kapag lumingon ka ..." and the "This is my voice after watching #myspecialtatay ...", measured in post volume, likes, comments, reposts and number of compilations, it appears that it is now acceptable to mimic persons with communication challenges in the name of entertainment and social media virality. The term "Boyet" is now an emerging euphemistic insult for anyone likened to persons with autism and intellectual disability -- just search #boyet on Twitter. Send this FAQs to anyone in your sphere of influence who has posted a #boyetchallenge video. If you have made a #boyetchallenge video, delete it now. If you are a parent, please talk to your kids. If you are a teacher, please discuss this in class. If you are part of a student group, please create a campaign on campus. Take a stand! And read more about the Autism Society Philippines' 1Pangako campaign at http://bit.ly/1pangako. About the contributor. Mona Magno-Veluz serves as the National President of the Autism Society Philippines. She engineered many of ASP's widely successful national programs and campaigns, such as Autism Works, 1Pangako, Project ChocolatA, Project GourmA, among others. She writes about parenting, family history and disability inclusion. She is a mom to three kids and a grandma to 12 cats. Find her on Twitter @mightymagulang.